For Pope Francis, ecumenical zeal is more his quest than a real concern for solutions to the rise of jihad. However, the Vatican’s ecumenism comes at the expense of Egypt’s human rights. Pope Francis, who is “building bridges to build peace” around the world, has naturally reached out to embrace Sunni Muslims. Last month, for the first time after years of Vatican silence, Pope Francis summoned to his private library in Rome grand imam Ahmed El-Tayeb of Cairo’s Al-Ahzar Mosque Institute. 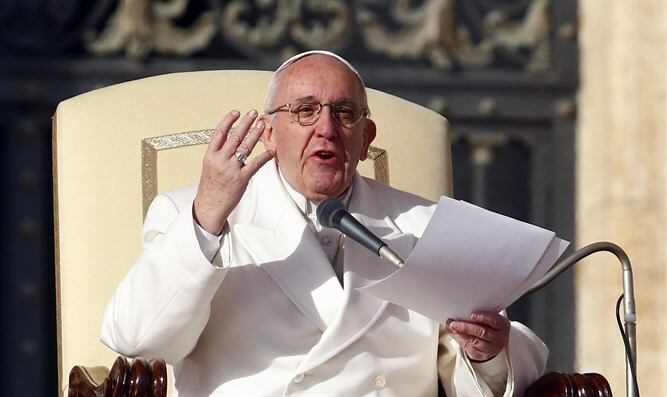 In a press release before this event, the Pope was quoted as saying, “this meeting is the message” – leading all to dwell on the meaning and purpose of their 25 minutes together. Christians, especially Egyptian Coptic Christians, have observed the Catholic pope give the “sign of peace” to the grand imam who has yet been unwilling to denounce ISIS. Unity existed between the two religious branches previous to former Pope Benedict XVI condemning Islam’s inclination to violence. This message of reconciliation comes during the Al-Sisi government which has stood opposed to the favored and protected status of an organization entwined with Al-Ahzar -- the Muslim Brotherhood – and against the ascendency of this terror network and others beginning before his presidential campaign. An elderly woman in Egypt is considered sacrosanct, and practically speaking, this means across sectarian lines she is universally respected for her tenderness and kindheartedness toward others. Even codified barbarity had had this limit - until now. Two days before their historic meeting, headlines around the world reported the violent and humiliating act committed by a Muslim mob in Upper Egypt against a Christian woman in a Christian-majority village. Homes were razed and a grandmother was stripped naked, dragged from her house and beaten in the street. Egypt’s courts are not officially Sharia but street justice involving private matters is strictly Islamic doctrine (coercion of non-Muslims), and violence has no real consequences in the courts. No words came from either of the leaders in the “Jubilee of Mercy” meeting (its official title) to address this incident, which by the nature of this attack holds deeper, more serious implications in Egyptian culture. An elderly woman in Egypt is considered sacrosanct, and practically speaking, this means across sectarian lines she is universally respected for her tenderness and kindheartedness toward others. Even codified barbarity had had this limit - until now. Solidarity (a hug and kisses) shown in this re-connection of Cairo’s Sunni grand imam with the Catholic Pope followed by silence (no official statements) helps to bolster and propel the po‎sition of the Institute’s goals for Egypt, which are far from optimal in the cause for freedom of religion and speech and the subject of human rights. It is not likely that Francis will meet with President Al-Sisi, if he hasn’t first already done so, even though by contrast Al-Sisi projects real hope for Egypt’s future in his committed struggle for freedom and equality. This we see in regard to Egypt’s deep state (the tentacles of Al-Ahzar religious brainwashing), from which Al-Sisi seeks to disentangle and de-program out of the administrations of the state. He rose to office on that claim and until now has produced evidence of genuineness along with impossible odds. It is logical to assume by Francis’ exclusion of Al-Sisi and, for that matter, Coptic Pope Tawadros II, who represents 20 million Christians, that building bridges was not foremost on the mind of Pope Francis. The absence of these key figures in the room does in itself shed light onto the meaning of the meeting; in effect, by this oversight, Francis acknowledges it. In the end, we are left with questions and speculation of what to expect in the aftermath of this meeting. Will the world see less vengeful oppo‎sition to the Roman pope’s 12th century crusade? Will we see a new edict declaring that jihad is inappropriate for today’s civilized world or Al-Ahzar denounce ISIS? Will we see a public statement by the two heads condemning the use of religion to commit violence? And finally, might all this potential good we await be based on a designation called “heavenly,” which the pope may have bestowed upon the Sunni sect during this meeting? For many decades, Cairo’s Muslim authorities have sought this label to prove religious equality with the faiths of Christianity and Judaism and have looked to the Roman Catholic pope for this ultimate seal of approval.